Friday party in the home of happy feet! 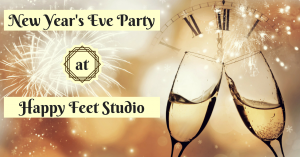 A great evening of dancing and hanging out in our cozy studio awaits you. 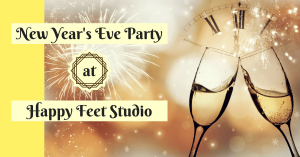 Dance your way into the new year with all your swing dancing friends. There will be dancing games, bubbles, Snowball live stream, and much more. The party will be hosted by Kuno & Gosia, who have many fun activities planned for the evening. Saturday Party in the home of happy feet! A great evening of dancing and hanging out in our cozy studio. This Party will be a 3rd Birthday Party of our studio, with live music from Copenhagen Washboard Five. Look forward to a friendly & fun weekend in Copenhagen with international dance instructors, live music, competitions, shows and great DJs. Friday Party in the home of happy feet! A great evening of dancing and hanging out in our cozy studio. This Party will be a part of Kulturnatten, with 4 intro classes for beginners: at 19, 20, 21 and 22. Friday Party in the home of happy feet! A great evening of dancing and hanging out in our cozy studio, with Halloween Theme and two dancefloors: one for Lindy Hop and one for Balboa/Shag. Friday Party in the home of happy feet! A great evening of dancing and hanging out in our cozy studio, with live music from Norbert Susemihl´s Joyful Gumbo Quartet. Friday Party in the home of happy feet! 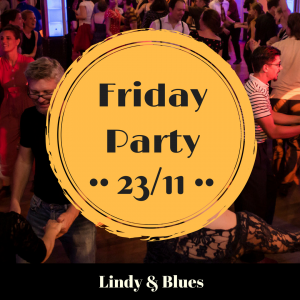 A great evening of dancing and hanging out in our cozy studio with two dancefloors: one for Lindy Hop and one for Blues. 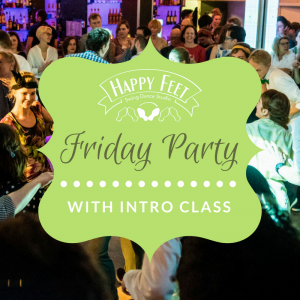 Friday Party in the home of happy feet! A great evening of dancing and hanging out in our cozy studio with live music from Jeppe Zacho Quartet.